....and it leaves me with mixed feelings. According to my math, I am an excellent candidate for an electric car. I have a truck for use in snow, on longer trips, or hauling anything serious. The majority of my driving is short trips in "city" conditions, with a max trip of about 20 miles away on occasion. Finally, the free maintenance on my GTI expired, and the warranty is up on it this month. 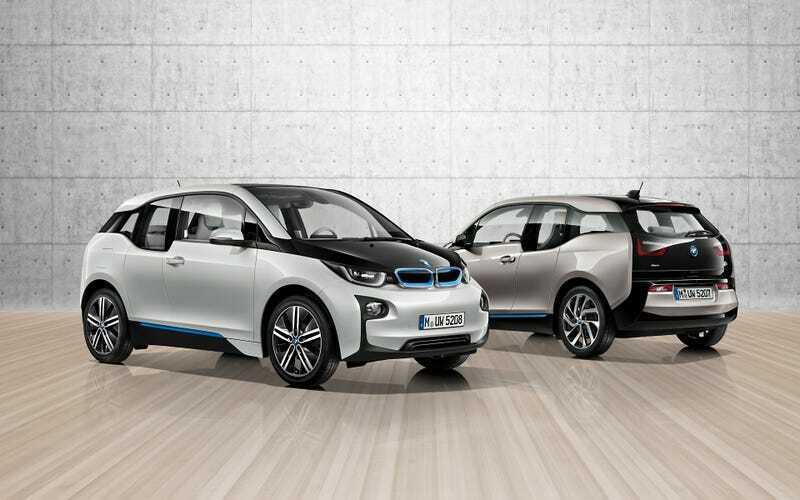 The driving experience of the I3 in itself was something completely new. I drove the electric-only version. The first thing I noticed was the instant "throttle" response, and seamless acceleration. It was so strange how you just stomp the accelerator at a stoplight, and then you just kinda zoom up to about 50mph effortlessly. No shifting, no lag, just straight zooming. My favorite part about the way it drove was the way it launched when turning at an intersection - The rear end just squatted down and it zoomed around the turn. Everything I've read mentions the aggressive regenerative braking when you let off the accelerator, and this is in fact the case. A bigger concern for me than "range anxiety" is "getting rear-ended anxiety" as a result of this. I hardly needed to touch the brakes, and after a few minutes to get adjusted it wasn't that bad. That said, there was a point where somebody in a beat up old Cavalier was tailgating me in a bit of traffic, and I was scared to let off the throttle pulling up to a light with them that close to my bumper. The I3 under no throttle is about the same as any other car with light-medium braking. I didn't want to hit the brakes either, as the brakes combined with the regeneration are equivalent to what I'd consider hard braking on a regular car. This made the experience a bit uncomfortable, as I wasn't sure the conditions that the brake lights would light up. There was no noise from the drivetrain except for a slight whirrrrr that can be best described as a Jetsons car off in the distance. At a stop it was eerily silent. Wind noise was pretty bad though. I'd call the overall noise levels at best comparable to my GTI at 70mph, at worst a bit louder. The seats are best described as different. I wouldn't call them crap, but I wouldn't call them great either. Definitely a step down from the awesome seats in the GTI, but not the worst I've sat in. I didn't get a chance to play with any of the cool toys, such as the auto parking or auto cruise control. As far as pricing goes, their initial offer for a low-mileage lease was honestly crap, and surpising at that. If I go for a purchase, I can get $9,500 in tax credits ($7,500 federal and $2,000 state), as long as I get it in by the end of the month. At the same time, after some discussions, they have a '14 320i with a manual and m-sport package (but no xenons) that will work out significantly cheaper on a lease. Personally I've been anti-320i since it's launch, but after looking at one (but not driving it), it starts to make more sense. I'm currently debating whether I want to pursue the I3 or 320i further, or go for one of two other routes (keep current GTI, or look at something else, like a new GTI). Regardless of what I personally do, I'm convinced that electric cars like the I3 are defintely the future. Once battery technology improves to the point that you can get 300 miles of range (for less than a $100k Tesla), we're going to see the popularity of electrics take off.